For general use, we'd give the Eee PC a higher rating, but as a portable music-making solution, it comes up just a little short. Robust. Incredibly small. Fabulously cheap! The best gadget since the iPhone. Screen too small for some apps. The processor is under-powered. 4GB of storage space isn't really enough. There´s a little machine that´s causing a big stir in the world of technology at the moment. 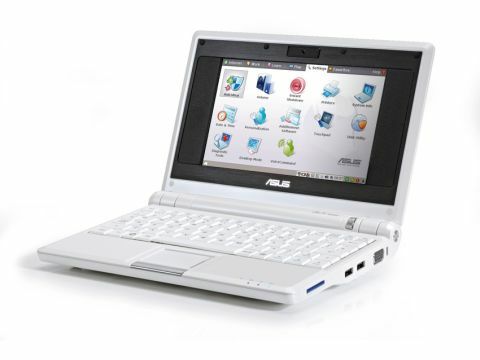 The Asus Eee PC was initially designed to be a laptop for children, but thanks to its incredible portability and low price, it´s rapidly garnered the attention of grown-ups and is selling by the truckload. We´re naturally keen to explore the machine´s potential as a portable music computer, although at first glance it certainly doesn´t seem like an obvious choice for DJs or producers. While the 7¨ LCD screen looks superb, it only operates at a resolution of 800x480, and the solid state storage weighs in at just 4GB (on the 4G 701 model). The 900MHz processor is hardly cutting edge, either - ditto the 2.5-hour battery life - and we took the liberty of upgrading the stock 512MB RAM to 1GB. But the EEE PC does come with three USB 2.0 ports, VGA out (which can drive a display at a higher resolution than the native one), wired and wireless networking, and a fast SD slot. There are also mini-jack stereo mic-in and line-out ports, which, given the tinny nature of the built-in speakers, you´ll be making good use of. The Eee comes pre-installed with an Asus-customised Xandros Linux distribution that places the emphasis firmly on keeping things simple. Applications are divided into sections; each has its own big icon and requires just a single click to be launched. Among the bundled applications are OpenOffice, Firefox and a decent media player. While this is all great for getting up and running immediately, the supplied software setup is very hard to customise. Happily, though, you can install Windows XP. Asus caters for would-be XP switchers by providing an XP driver CD. We chose to use nLite to create a stripped-down installation that minimised the impact on the 4GB system drive. After installing a few music applications, it quickly becomes clear that the relatively small screen resolution is an issue. Traktor DJ Studio, Psycle, Renoise, Mixxx and, to a lesser extent, Ableton Live, all suffer. They all perform reasonably well, though (we were able to get four audio clips running simultaneously in Complex mode in Live), and when hooked up to an external LCD display, you can see them in glorious 1280x1024. Much more joy can be had with Reason, MadTracker and BeRoTracker, all of which work just fine with the Eee´s LCD and benefit from the included utility that virtually enlarges the resolution to 800x600 by creating a vertically scrolling desktop. Although the Eee is a superb device, you do have to be selective about the software you run on it. It won´t let you pile on many of the latest plug-ins or run a monster DAW, but it´s compact, looks and feels awesome and won´t break the bank.